Talk to a few of Jenni Buckley’s students, and they might tell you she’s their favorite professor. Now, this University of Delaware engineering professor is being recognized as one of the best anywhere. Ajay Prasad, Engineering Alumni Distinguished Professor and chair of the Department of Mechanical Engineering, had high praise when he nominated Buckley for the honor. “Dr. Buckley has been on our department’s faculty for the past six years, and during this time, she has single-handedly transformed our undergraduate curriculum,” he said. 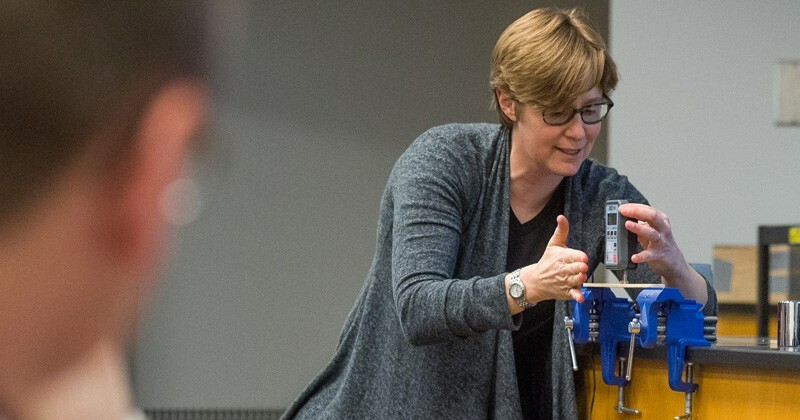 She leads the mechanical engineering department’s senior design program, has attracted industry funding for the state-of-the-art Design Studio, a makerspace for engineering students, and much more. “In my 25 years in this department, I have never seen our students as energized, enthusiastic and motivated,” Prasad said. Even during a 9:30 a.m. class, Buckley keeps students alert and engaged. She walks around the room instead of lecturing from the front. She asks students to solve real-world problems—like how to choose a spring with enough elastic potential energy to launch a golf ball across the room. Erin Rezich, a rising senior in mechanical engineering at UD, has had classes with Buckley and also worked under her supervision as a teaching assistant in the Design Studio. Rezich, who hopes to work for NASA someday, said Buckley’s “let’s make it work” attitude and visible love of her job have made a huge impact on her. “I can honestly say that I would not be the engineer or mentor that I am today without the guidance of Dr. Buckley,” said Rezich. However, her outreach efforts help more than just undergraduate students. Through Project Lead The Way, a nationwide organization that aims to help students build science and engineering skills, Buckley is involved with teacher professional development and student pipeline issues from preschool through high school. For example, in 2017, at UD’s Body Mechanics camp, sponsored by the UD’s Laboratory Preschool, four-year-olds learned about scoliosis by joining Jenni Buckley on the floor of the Design Lab to contort themselves into S shapes. Buckley has been recognized with the 2018 College of Engineering Dean’s Award for Excellence in Community Service and Engagement. In 2016, she was recognized with UD’s Trabant Award for Women’s Equity. Outside UD, Buckley is also the co-founder of the Perry Initiative, aimed at inspiring young women to be leaders in engineering and orthopedic surgery. Founded in 2009 by Buckley and orthopedic surgeon Dr. Lisa Lattanza, this nonprofit now runs more than 40 outreach programs nationwide and has reached thousands of high school, college, and medical students. Buckley joined the UD faculty in 2011. It was a homecoming for this Blue Hen, who earned an undergraduate degree in engineering from UD in 2001. She later earned her master’s (2004) and doctorate (2006) in mechanical engineering from the University of California, Berkeley. As an undergraduate, Buckley was a member of UD’s rowing squad and led the crew to a number of victories. In 2017, she was the first rower to be inducted into the UD Athletics Hall of Fame.